Our collection embraces folk and traditional instruments that have been used in the past or are presently being used by ethnic groups around the world. Musical instruments, perhaps better than anything else, personify the character of a people. They are assigned an important role in rituals, dances, liturgies and virtually all ceremonies linked to the life cycle of traditional societies. Instruments contain valuable information on the social, religious, ethical and aesthetic values of the diverse cultures of the world. The graceful shapes and perfect dimensions of certain instruments, added to the richness of their timbre, justify a science which generation after generation has never ceased to astound. All sonorous manifestations are a sign of life. Many cultures have abandoned the instruments that once formed part of their traditions, casting them aside for modern organological trends. In many cases, the only places such instruments can be found is in museums. The instruments in this collection range from 200 years old to quite recent. Because of the materials used in constructing the instruments (reed, wood, leather, plant fibres, etc. ), they tend to be particularly vulnerable to environmental conditions. Therefore, only in rare cases do we find older pieces. Idiophones: musical instruments which create sound by vibration of their own materials. Membranophones: musical instruments whose sound is produced by a vibrating membrane. Chordophones: musical instruments whose sound is produced by a vibrating string. Aerophones: musical instrument which produces sound primarily by causing a body of air to vibrate. MUSIC TO SEE arranges temporary exhibitions drawn from its collection of musical instruments from cultures around the world. These travelling exhibitions feature musical instruments or objects used by different ethnic, geographic and social groups in their dances, songs, rituals and ceremonies. It is a journey in time through different musical cultures. The exhibitions have engaged all types of audiences, and response has been overwhelmingly positive owing to both educational value and originality. Our idea is based mainly on highlighting the ethnological, musicological and aesthetic values of the instruments. 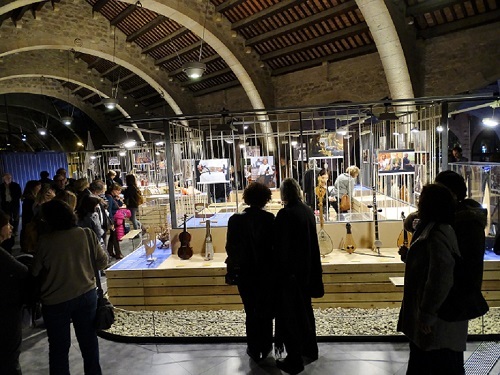 The exhibition can be organised from a general perspective, – focus on an educational point of view displaying the instruments in families and subfamilies – or using a monographic approach. 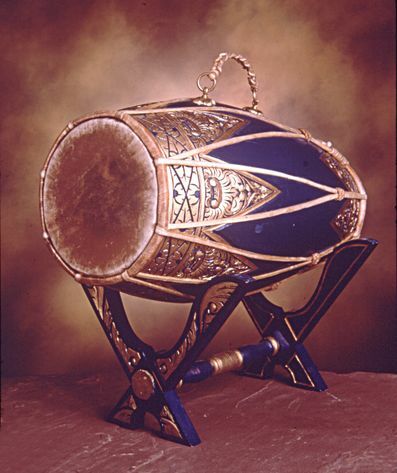 Black Africa; Balkan Countries; Bagpipes; Violins; Asia; Around the World in 80 Instruments; and Idiophones of the World. Other ideas include monographic exhibits by country, construction materials, use, geographic area, specific itineraries and musical instruments in philately. The mechanism for organising an exhibition is simple. A specific number of instruments is selected, normally determined by the amount of available exhibition space. Around 150 instruments is a perfectly reasonable number to ensure a good display. An exhibit of this size would require approximately 120-130 m2 of display space. However, depending on available space, the number of instruments can easily be increased to 200, 300, 400, or reduced to 100 or fewer. As a general idea, we estimate that about 125 instruments can be displayed in a 100 m2; 250 instruments in 200 m2; etc. The cost for mounting an exhibition varies, depending on the number of instruments and their value. Insurance and shipping costs must also be added to the price. To learn more about commissioning an exhibition, contact us by phone or e-mail.